You know when you pull a thread and you can’t stop? Meet Hugo and read about his adventure with a really, really, really long string. One day, Hugo discovers a mysterious red string. He is curious to know where it leads, sure that it will guide him to something fabulous. 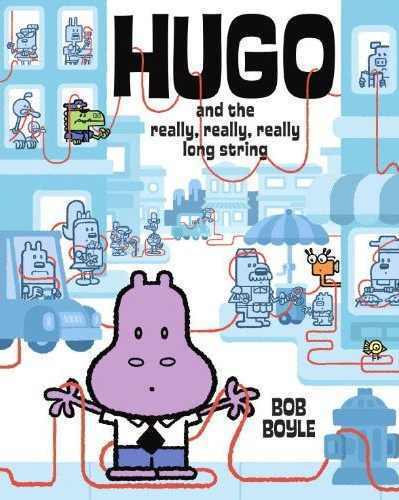 Hugo and the Really, Really, Really Long String by Bob Boyle tells the story of Hugo’s adventure over hills, down holes, across rivers and through the city to discover what is at the end of the red string. During his adventure Hugo is joined by a number of new friends, also curious to discover what is at the end of the string. Boyle’s quirky illustrations may look familiar – he is also the creator of the children’s animated program Wow! Wow! Wubbzy! His signature animated, geometric art style is fantastic – I particularly like his ‘square’ hills, bonsai-like trees and the funny illustration of the noodle shop, complete with bunnies trying to sort red string from noodles. It’s tempting to tell you what is at the end of the really, really, really long red string but I won’t spoil it – it’s worth the wait and certainly gets a giggle out of my kids. Observant readers might also recognise the opportunity for a sequel about a really, really, really long blue string.